The Brits from Which? did a battery test recently, where the world's flagship smartphones were pitted against each other for your viewing pleasure. In the test conditions the phones' screens were set to one and the same comfortable for reading brightness level, rather than turning them up to the maximum, since brighter screens would consume more energy in principle. Browsing time was recorded over a 3G connection, which puts strain on the battery both from the display and network connectivity. Despite Samsung's recent share price woes due to its disappointing guidance on high-end phones slowdown, the Galaxy S4 consistently proves that it might not take your heart with design and new features, but it is a very, very balanced smartphone, consistently scoring at the top of camera and now battery tests. It was also a fast charger, though the iPhone 5 took the cake in the charging speed category. There are no phablets in the infographic, but the testers say that if there were, the Note II with its huge battery unit had shown to beat them all in its turn. Samsung have plenty cash in the bank, loads of other lucrative businesses, a great amount of control in hardware production etc.... Don't feel sorry for them, they'll be perfectly fine ;) rather feel sorry for companies like Sony, Nokia, Htc etc... Who barely make any money. Even Sony's CEO said they don't have much money, feel sorry for them. you should feel sorry for yourself as you give them your or your parents cash. 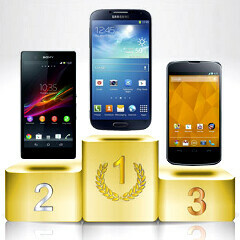 On GSM Arena HTC One topped the chart with longest internet browsing time followed by iPhone. So haters are probably laughing. What would have happened to Samsung if Nokia made android? They'd probably lose a few customers, nothing major. Nokia would probably become the No.2 Android maker after Samsung. no one can predict the future, if nokia joins android and shows off their hardware, other companies will step up aswell especially samsung who has billions to spare. Thought something was fishy with those charts. yep. 2 truth and one lie in between.. the classic strategy to conceal a lie.. seriously its a shame for a journalist to post such a wrong data. people can go to websites like anandtech.com or engadget or gsmarena .. or whatever to see that iphone and ONE are the best smartphones in terms of internet battery life.. my problem is their numbers.. seriously!! 260 minutes??? only 4 hours for iphone??? the industry standard for internet browsing battery life for both wifi and LTE?? These articles don't measure the same thing. The laptopmag article measures web browsing on LTE which is different than on 3G. The PhoneArena article uses 3G. The GSMArena article does not mention what type of connectivity (3G/LTE/WiFi). The talk time as measured by GSMArena is 522 minutes. That is close to the PhoneArena article which is 499 minutes. Also, the phones that are compared are not the same save for the iPhone. Since LTE is supposed to drain more power, the 3G should provide higher battery runtime. Which still means the results here seem to be skewed. The S4 winning like a boss, and that WITHOUT video playback time, which is AMOLED territory. The GS3 has a bigger battery... Have you not seen the battery capacity of the S4 or One yet?